Millions of people drink green tea daily. There are many reasons for doing so: aside from being a cultural habit, it aids digestion, helps students stay awake during boring university lectures, and fights heart disease and maybe cancer. Another good reason is that green tea appears to trigger weight loss. It does so by stimulating the body to burn calories, thereby decreasing body fat. So what’s so special about green tea? All real teas – black tea, oolong tea and green tea – are produced from Camellia sinensis plants. But only green tea leaves are not fermented before they are steamed and dried. Steaming destroys the enzyme polyphenol oxidase in fresh leaves. Fermentation is done to oxidise substances in the freshly picked tea leaves to dry. This enzymatic oxidation process may be stopped by pan-frying or steaming leaves before they have completely dried. All teas contain large amounts of aromatic compounds which have aromatic ring structures like benzene. 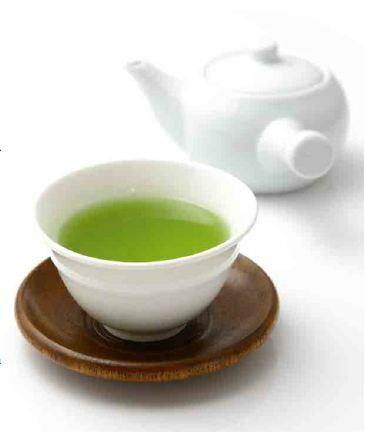 Unfermented green tea is particularly rich in one type of polyphenols: catechins. Last year researchers at Kao Corporation in Japan looked at the effects of catechins on reducing body fat in two groups of 35 men. All were of similar weight (based on their BMI, body mass index) and waist size. For three months, group No 1 drank daily a bottle of oolong tea fortified with green tea extract containing 690 milligrams of catechins. The other group drank a bottle of oolong tea with only 22 milligrams of catechins. Overall total diets were similar. After three months, the men who drank the strong green tea extract lost 2.4 kg versus 1.3 kg in the control group. They had a significantly greater decrease in BMI, waist size, and total body fat. In addition, “bad” low-density lipoprotein (LDL) cholesterol went down in the men who drank the green tea extract. So, what does it mean for us? One should drink at least four cups a day. Green tea extract supplements are also available. Researchers are also hunting for the exact substance that reduces body fat. Epogallocatechin gallate (EGCG) is the most abundant catechin out of the dozens present in green tea. During black tea production, the catechins are converted to ineffective theaflavins and thearubigins. Therefore, black tea is not high in catechins. Kao Corporation is now profitably selling capsules with green tea extract. EGCG seems to directly attack unwelcome and unhealthy belly fat. Research at Tufts University in Boston showed that EGCG activates genes responsible for burning fat in the belly area. It accelerates weight loss by incredible 77 per cent. Now I know already two drinks that are good for health: red wine, with its flavonoids, and green tea. I will now take a bottle of green tea to the gym for my workouts, and enjoy a glass of red wine with dinner. Meanwhile, for the hot summer in Hong Kong, I found on the internet an excellent recipe for fat burning tea. The tea is sweetened with stevie – a herb that is naturally sweet and without calories. Bring the water to boil. Add the green tea bags and let steep for five to 10 minutes. Meanwhile, juice the lemons and add the stevia. Add ice to the green tea and allow to cool before adding the lemon juice-stevia mixture. Stir until mixed and enjoy served over ice. Garnish with a sprig of mint if desired. Enjoy!